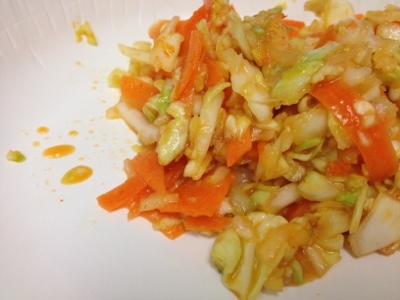 Large bowl: combine cabbage, carrots and green onions. Set aside. Small bowl: Combine the rest of the ingredients to create a dressing and pour over the cabbage. Toss to combine and let salad sit for 10 minutes to 24 hours to marry flavors. The longer the better. Make it a complete dish by adding some baked tofu on top.